On Feb 11 I wrote The Explainer: Will Israel attack Iran?. Since then there have been bombings targeting Israeli diplomats in New Delhi, Tbilisi (Georgia's capital) and Bangkok. These attacks have been blamed by Israel on Iran. 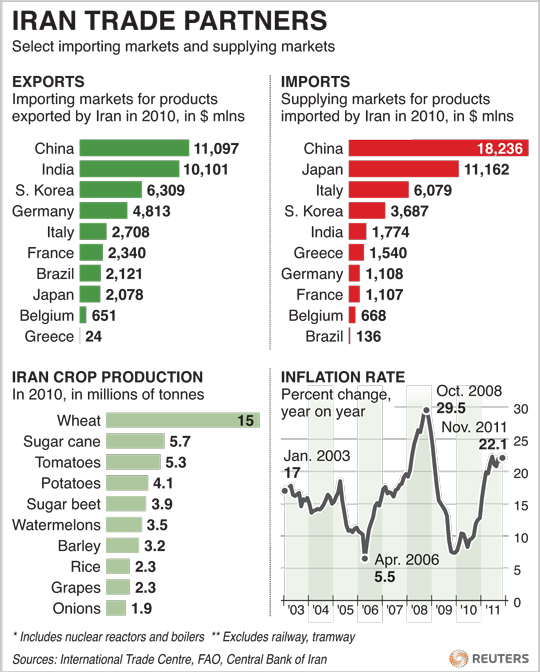 In view of the international sanctions against Iran, here is an interesting infographic from Reuters. buddy can u find and upload an INDIA EXPORT IMPORT INFOGRAPHIC if u find one? I am regular reader of this blog.and i find this blog really helpful in my GD PI Preparation.